This all too common ailment afflicts nearly as many as the flu, but it can be even more devastating to vegans who cannot easily satisfy their donut craving. Recently a friend of mine fell victim to this affliction, and a very rare strain known as mini-donut fever. As you may know, the only cure is to eat donuts, in this case mini-donuts. So we set out on a mission to make our own vegan mini donuts using the recipe from Vegan Yum Yum as a starting place. It should have been an an easy enough task, with a clear recipe to follow, but things did not go as planned. Plain baked donuts are good, but blueberry sounded even better so we threw in a handful of wild blueberries to the batter of our first batch, but the batter was already looking awfully wet. We carried on, hoping for the best. The best was not so good. Despite the recipe saying that you should not grease the pan (it was non-stick anyway) the donuts stuck horribly, and because the added berries, fell apart when you tried to remove them. They still tasted rather good though, so we ate a few of the ugly bits. Round two, we added more flour and greased the pan. This batch came out better than the last but as they sat out, became rather crunchy. I would still consider these fairly successful. We glazed them with a blueberry juice glaze which was fantastic and so pretty. Next we decided to go for some pumpkin spice donuts. This time we abandoned the recipe completely. Bad idea. While these donuts had the correct consistency, fluffy and light, the flavor was just off completely. There was neither enough pumpkin nor spice. 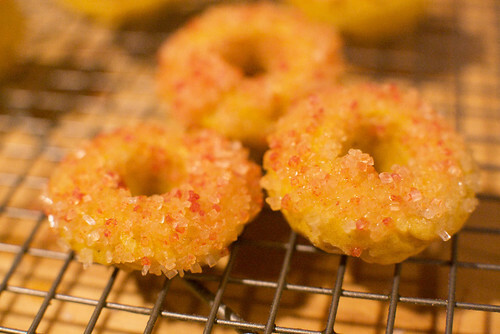 Three out of three taste testers agreed, these donuts tasted like…hay. Yep, you got that right. They tasted like dried grass. I’m sure you could pass them off to some unsuspecting health-food type, but that is not what we were interested in. We had already frosted them before we realized that they tasted so bad, so at least they looked pretty. The unfortunate side effect of this endeavor is that I’ve now come down with donut fever myself. Look out for some more (hopefully more successful) donut making in the near future. Also get ready because it’s almost time for Veganmofo 2009. I can’t wait to get cookin’. Last year’s veganmofo really inspired me to work harder on this blog and get it going from something that I did only for myself to something I shared with people. I love the recipe from Vegan Yum Yum but I had to alter it a bit to get it just right for me. Lovely photos! I tried that recipe as well, they didn’t go so well but I de-glutened the recipe. 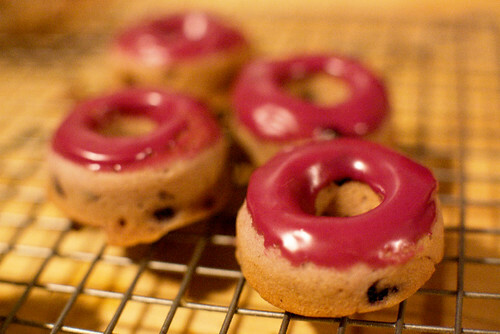 That blueberry glaze looks amazingly good! I got a mini donut pan ages ago for the exact reason of trying my hand at those VeganYumYum donuts…and I still haven’t gotten around to it. I’m looking forward to your next mini donut experiments! Ohhhhh wow that looks sooooo good. I saw them and i think i had to wipe away the drool from my mouth. Oooops, silly donuts! Don’t they know they’re supposed to work? Hee hee. Mini donut fever. I’ve been eyeing these donuts since last night. They look fantastic!